With April being National Poetry Month, it’s fitting to make a poem our first State Library “jewel” contestant for the month. 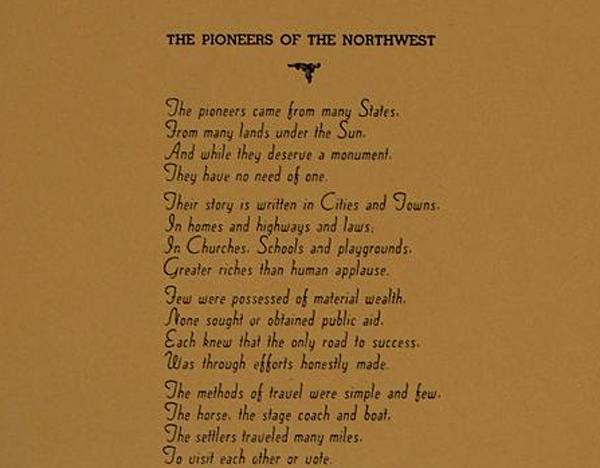 Entitled “The Pioneers of the Northwest,” this ode was composed by W.E. McCroskey. The State Library staff doesn’t know for sure when it was written, but one guess is sometime between 1935 and 1945. The framed print possessed by the State Library has a note that states it was presented by the Colfax chapter of the Daughters of the Pioneers of Washington on Sept. 30, 1949. The pioneers came from many States. From many lands under the Sun. And while they deserve a monument. They have no need of one. Their story is written in Cities and Towns. In homes and highways and laws. In Churches, Schools and playgrounds. Greater riches than human applause. They were possessed of material wealth. None sought or obtained public aid. Each knew that the only road to success. Was through efforts honestly made. The methods of travel were simple and few. The horse, the stage coach and boat. The settlers traveled many miles. To visit each other or vote. They challenged the desert and made it bloom. They conquered the mountain slopes. They carved out an Empire in the West. Far exceeding their fondest hopes. The latch string was out for all alike. Their labor and food they shared. And to help a neighbor in distress. Neither time or effort was spared. Their children were taught to labor. Wives and mothers were brave and true. Few conveniences were had for their tasks. Many hardships and problems they knew. They built not alone for family and self. But made plain the paths ahead. That those who were to follow them. Might safely and worthily tread. We of the present and those to follow. Can not share in the hardships they knew. But we can express our gratitude. Their courage, wisdom and foresight. In building the heritage we claim. And by striving to ever be worthy. Of the Pioneer record and name. The poem is not to be reproduced without consent of the copyright holder and that it is provided here for educational purposes only. According to his obituary, McCroskey was born in Monroe County, Tennessee, and moved to Eastern Washington where he was admitted to the state bar in Whitman County in 1895. He practiced law in Palouse, Colfax and Walla Walla. McCroskey served as Walla Walla’s mayor and was a Democratic candidate for Lieutenant Governor. We’ll feature two other State Library jewels in the coming days. Afterwards, we’ll open our online poll to let you choose which one you like best.